When people ask me, what I like the most about living in the Netherlands, the answer is very simple. I love the short distances: they make enjoying daytrips and weekend getaways ridiculously easy even when you are a student who has little spare time and money. For traveling, Leiden’s location in the heart of South Holland is perfect. 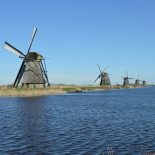 Therefore, I wanted to share you my current favorite weekend trip destinations in the Netherlands. Last April, I traveled to Amersfoort to relax a bit in the middle of the exams. I knew nothing about the town before going there, but it turned out to be a perfect choice for that purpose. Amersfoort is an adorable town that was established in the Middle Ages. In Amersfoort, one can still see plenty of medieval architecture by taking a stroll along Muurhuizen (i.e., wall houses) and other cute little streets. If you are not afraid of heights, I recommend you to climb up to the Onze-Lieve-Vrouwentoren, one of tallest medieval church towers in the Netherlands. Another thing I love about the Netherlands: pannenkoekenhuizen! At the moment, my favorite pancake place is Den Potsenmaeker in Amersfoort. The restaurant is decorated in an old-fashioned style, and their menu includes also whole-wheat and gluten-free options. Many people love Amsterdam, others prefer The Hague. My relationship with Rotterdam has been love from the very first sight. Rotterdam is nothing you would expect when coming to the Netherlands. Instead of adorable canals and buildings that look like gingerbread houses, you get to wander in the middle of skyscrapers, massive bridges, and crazy modern architecture. Indeed, Rotterdam is like an enormous museum of modern art – and the entrance is free of charge. I travel to Rotterdam every time that I want to sense that big city feeling. Visiting the brand new market hall and Witte de Withstraat with its hipster-friendly restaurants is always a blast. Rotterdam is also a great place for shopping. Southern part of the Netherlands is quite different from Randstad area where Leiden and the biggest cities of the country locate. Actually, when you arrive to Maastricht – one of the southernmost towns in the Netherlands – you may trick yourself to think that you have actually arrived to Northern France. Around Maastricht, you can find hills, real forest, and even wine regions. The city center is old and charming, but since Maastricht is also the capital of Limburg, there is quite a lot to see in comparison to many towns of same size: Rent a bike and go to see the Mount Saint Peter. Buy a museum card and visit the Natural History Museum and other museums of Maastricht. Visit a vineyard or brewery. Or just take a long walk and enjoy the atmosphere. Maastricht is easy to combine with its neighbor towns Aachen (Germany) and Liege (Belgium) if you feel like seeing more and actually going abroad. What are your favorite Dutch towns? Maastricht is very beautiful and different indeed. Definitely worth a visit! Hi Deniz! Thank you for your comment. I totally agree with you, and will definitely pay a visit to Maastricht again some time soon. This entry was posted on October 23, 2016 by ajhaapala in Anu, Leisure, Student Life, Travel.